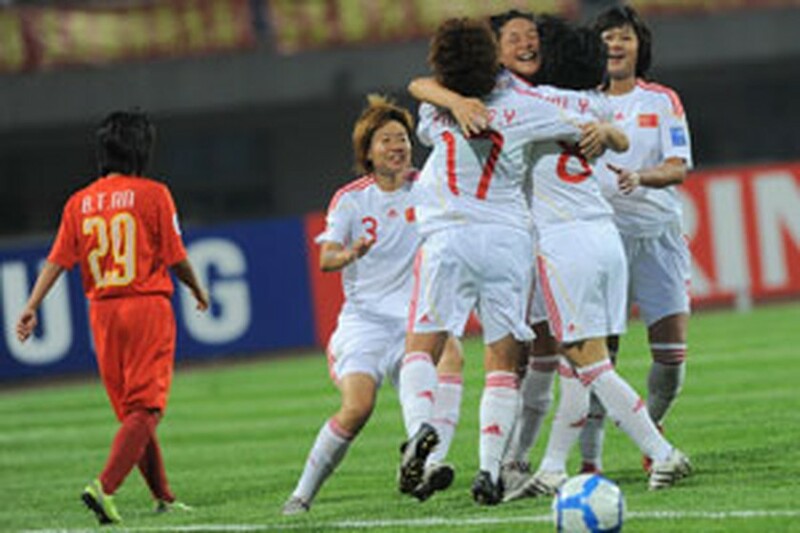 Hosts China moved within touching distance of the semi-finals of the AFC Women’s Asian Cup 2010 after easing to a 5-0 victory over Vietnam on Friday at Shuangliu Sports Centre in Chengdu. The 2008 runners-up were fortunate to escape Wednesday's Group B opener against Korea Republic with a point, but had no such problems against Vietnam as Li Danyang, Yuan Fan, Zhang Rui and captain Bi Yan scored in the first half. Fit-again striker Han Duan got her name on the score-sheet at the start of the second half to wrap up the win and after Australia earlier beat Korea Republic 3-1 to secure a place in the semi-finals, China only need a point against the Matildas on Sunday to also advance. China quickly imposed themselves on the contest and opened the scoring after just eight minutes as Liu Huana was allowed time and space on the edge of the area to pick out the darting run of fellow full-back Li Dayang and the defender rose above the Vietnam back line to send an unstoppable header over goalkeeper Dang Thi Kieu Trinh. And Kieu Trinh was again beaten four minutes later as centre-back Yuan turned home an in-swinging corner from Bi to the delight of the passionate and vocal home support. The hosts continued to control the contest with almost persistent possession in the Vietnam half and after Kieu Trinh beat away Han's low curling free-kick, striker Xu Yuan had the ball in the Vietnam net 12 minutes before the break but the effort was quickly ruled out for offside. But China's third arrived eight minutes before half-time after midfielder Zhang skipped into the Vietnam area off the left wing and after evading two tackles, calmly lifted the ball over Kieu Trinh. And on the stroke of half-time Li was felled just inside the penalty area following a storming run and Bi stepped up to fire high into the top corner from 12 yards. Coach Shang Ruihua used the comfortable lead to withdraw captain Bi and striker Xu at the break, but China did not ease up and after flashing an effort wide just after the restart, Han's looping header from Zhang's cross extended the advantage five minutes after the break. Kieu Trinh denied Zhang just after the hour mark before Han fired straight at the Vietnam goalkeeper from a tight angle as a string of further changes slowed the pace of the contest on a damp pitch. 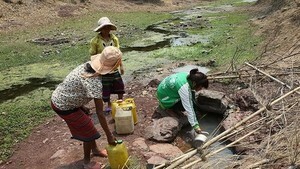 On Wednesday, Australia defeated Vietnam 2-0. The four teams in Group B are Australia, China, South Korea and Vietnam.